3 Dinge die im Laufe des Sommers fertig wurden. sondern die herrliche Zeit draußen verbracht. zu häkeln, war gar nicht schlimm! Hey I'm happy to see you here! My first project for this hop is this Granny Square blanket. so I spent most days outside in the sun reading and gardening. doing some crocket and knitting. good to be prepared for the winter. und zwar ein Tuch aus einem Rest Kauni Garn. Das 3. Projekt sollte mit kariertem Gingham Stoff genäht werden. diesem perfekten Schnitt und die vielen Fotos in der Anleitung. It is a Schnabelina Bag! The pattern ist absoutely perfect and it is for free! Meterweise karierte Paspeln, finde ich super! for beeing a great cheerleader in this hop. Want to know more? Please read this. Liebe Bente, traumhaft Deine Oma-Platz-Decke, freue Dich nun ist sie fertig, auch das Tuch sieht sehr schön aus. Ganz besonders gefällt mir natürlich Deine Schnabelina, Du wirst sie lieben. 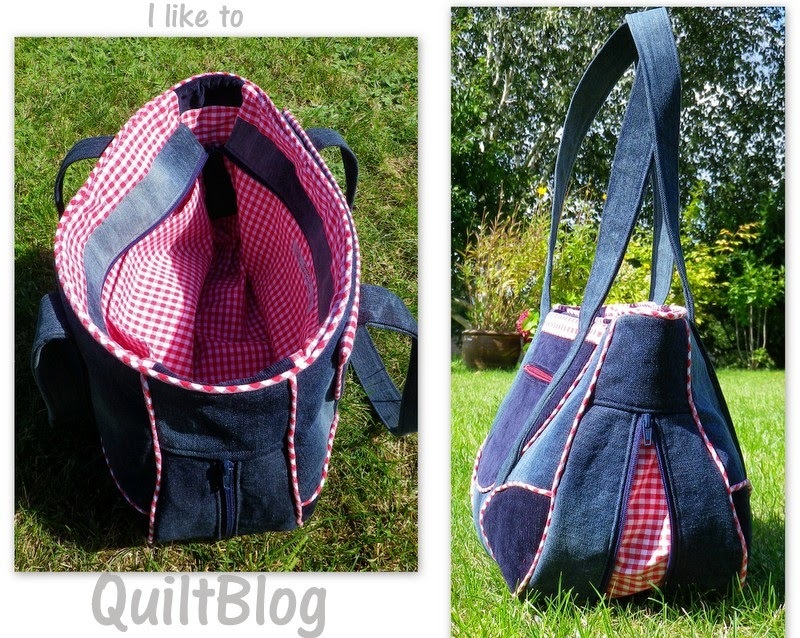 All lovely projects - the bag is just super and thank you for the link to the pattern. Your blanket and scarves are beautiful! Love your bag with the gingham inside. Thank you for sharing your Summer. ein sehr schöner Post und deine Schnabelina ist echt toll geworden. Your granny square blanket is beautiful. I am always envious of yarn work because I have no skill with it. That expandable bag is wonderful and you are right about gingham piping. It does ROCK! Deine Schnabelina sieht Klasse aus. Ich finde die karierten Paspeln einfach genial. Deine Schnabelina sieht fantastisch aus,mit den Paspeln einfach genial. Lovely projects. My favourites are the bags. da hast du drei wunderbare Projekte im Sommer gehabt! Die Decke hat wunderbare Farben und gefällt mir sehr, aber der Knaller ist ja die Tasche! Ich mag Jeans ja sowieso und mit der karierten Paspel - eine Freude! Wow - so fleißig. Alle deine Projekte sind ein Traum. Die Schnabelina Bag ganz besonders! Super gelungen. da warst du richtig fleißig. Alle Projekte gefallen mir sehr gut. Besonders deine Schnabelina ist super. Die karierte Paspel ist ein richtiger Hingucker. Your bag is absolutely beautiful. I like the piping. Granny squares are a favorite of mine. All your projects are wonderful. Fantastic crochet...and absolutely beautiful knitted scarf; just love the coloured yarn you chose. And I really love what you did with that bag. Gingham really makes everything beautiful! Och, die Tasche ist dir super gelungen!!! Ich hatte die Anleitungen schon lange gespeichert, aber irgendwie rennt die Zeit davon, der Sommer war bei uns in der Schweiz auch nicht soooo toll, dafür habe ich mehr genäht. Ich würde gerne mir mehr Zeit nehmen für's Häkeln, aber alles kann Frau nicht machen, oder? Auf jedenfall bin ich ganz schön neidisch auf deine Decke, irgendwann werde ich auch mal beginnen, mal schauen, wird wohl ein Dekaden-Projekt, lach! Beautiful projects! I really like your bag. Wonderful projects. I really love your bag! very nice pieces, but that bag!!!!!! I now want one just like it. 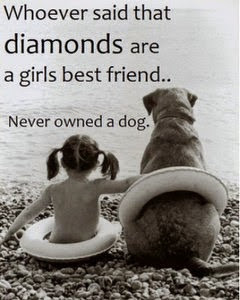 Love it!!!! 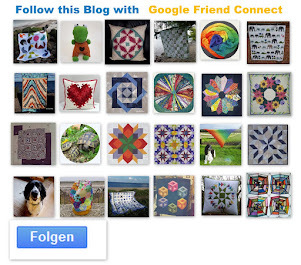 Coole Idee und tolle Sachen! Your knitted/crocheted projects are beautiful! Oooooh, and that bag is just amazing! Your projects are really lovely, but I LOVE that bag with the gingham piping. The granny square throw is so beautiful and reminds me so much of one my grandmother made years ago. The knitted scarf is really nice! I love the colors! The bag is perfect for the gingham! I love the gingham piping!!! All of your projects are really nice but I really really like that bag and am sad that the pattern isn't in English so I can understand as I would love to make one! Thanks for the pictures. That bag to just GREAT !! I love the red and white gingham and denim together....that says friendly folks to me. I don't know a thing about crochet, but I know what's pretty and yours is ! And your knitted scarf is beautiful Bente ! Na, da sind ja supertolle Sachen fertig geworden. Sehr gut! Danke! I have reached the limit of my written German! 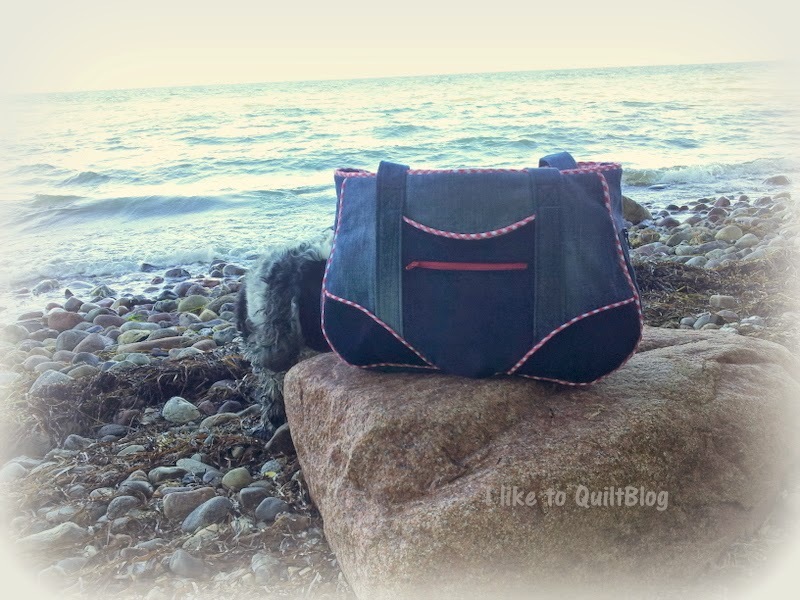 Seriously love your bag - thank you so much for posting the link...I'm off to get the pattern!!! I must make that bag! Es ist wünderbar. Bente, what wonderful projects! A granny-square afghan is on my to-do list - did you knit or crochet the squares? The colors are luscious - fantastisch! And such a wonderful scarf. 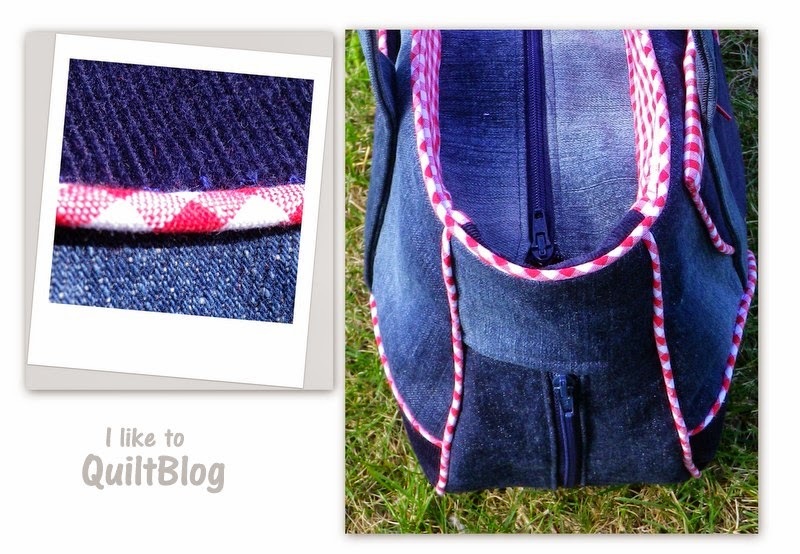 Thanks for sharing your adorable bag - gingham makes the best piping - thanks for the link! Super, liebe Bente, und alles so toll präsentiert!!!! Wie kreativ du bist!!!! drei tolle finishes!!! Die Decke ist ja ein Traum und deine Schnabelina sieht soooo schön aus. Toll. Your yarn creations are lovely! And your bag is fabulouse. Great way to use the gingham. PERFECTION! Each of your items were done with such expertise!!! Made for a lovely summer indeed!!!! LOVE LOVE LOVE!!! Your blanket is beautiful!!!! I love all the colors that you choose for it. But that bag...I love it. I never seen a bag like that. 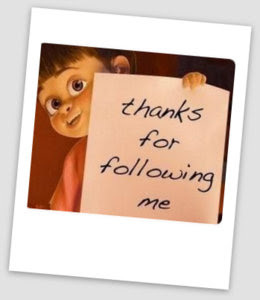 Thank you for sharing and for the link. I am heading there now. Hello Bente. Your crochet projects are so lovely. 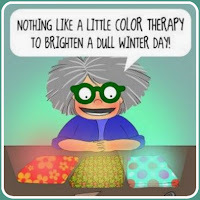 i love all the colors in your afghan and it will be so nice to have while you are sitting on your couch this Winter. But my favorite is the purse. I really, really love how it is made. The gingham piping really adds a wow factor. thank you so much for sharing. Wunderschöne Sachen sind bei Dir über den Sommer fertig geworden. Die Decke ist total klasse, ganz tolle Farben. 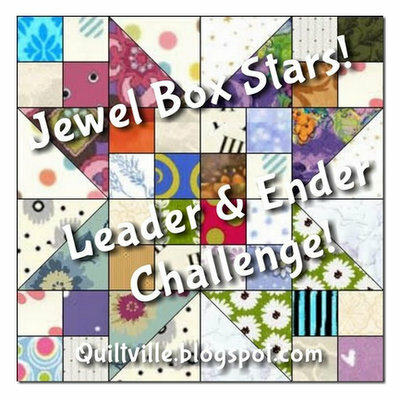 Your crocheted quilt is wonderful - love the colors and I thought using the black to join the blocks was perfect! I'm always in awe of people who can crochet and keep their tension so beautifully. The bag you made is awesome! What a neat way to use the RB gingham. I noticed that the bag had a zipper at the bottom - I assume you open it when you have extra stuff to carry around. That's a cool idea. You are a person with many talents! All of your projects are wonderful. Thank You for sharing! All beautiful projects Bente. I'm totally in love with your Schnabelina Bag ... it's gorgeous! Beautiful projects Bente , I especially love the bag ! Very lovely projects. The bag is awesome! You have been busy! That's a lovely granny square quilt. Beautiful colors in the scarf. The bag is wonderful and as always, stitched perfectly. Lovely projects. I like the bag. super dass die Decke nun fertig geworden ist. Die ist wirklich super schoen! Und mit deinem "Halsschmeichler" bist du ja scon gut geruestet. Tolle Farben gegen den Novemberblues...Und deine Tasche finde ich wunderschoen. Jeans mit Gingham, ein Hit. Viel Freude beim ausfuehren. Du hast über den Sommer drei wunderschöne Sachen fertig bekommen, alles ganz nach meinem Geschmack! Die Tasche will ich ja schon so lange machen und die Stoffe die Du genommen hast sind super dafür! Und Deine Granny Decke ist richtig schön geworden. Bei uns war der Sommer leider nicht schön, ich hätte die Decke wohl schon im August brauchen können. Your afghan brings back many wonderful memories of my grandmother crocheting away in our living room. She taught me and my sister both how to crochet but my elbow locks up if I do. My older sis can crochet up a storm though and does some beautiful things. Love your projects for today! I love your bag!! Gingham is great for piping and for binding!! I love all your projects but I NEED to make that bag for my daughter as a baby bag. She just adopted a brand new baby boy! But Oh I am so afraid of piping! I've avoided making it which has counted me out of several nice projects. I'm sure a You Tube exists to show me how. I have to see someone actually doing a technique before I get it. Thanks for sharing! Each and every one is delightful. Gorgeous quilt. Bente, You always have stimulating projects. The Granny Square afghan is amazing! I love the knitted cloth. I wish I could crochet. It's not my forte at alll. The bag is absolutely phenomenal. AND the patterns is FREE. I downloaded all the sizes. My daughter is a teacher and I think it would be a great carryall for some of her school items. Thanks for participating in the hop and stimulating us. Lovely projects! Your purse is very cute. Wonderful projects! Your bag is beautiful and I can't wait to make mine. Hi Bente! Fabulous post! Your granny squares made me smile! 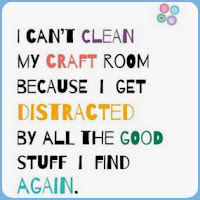 I have a boatload of yarn and I am inspired! Your bag is beautiful. I love the fabric choices and your workmanship is awesome. I am so glad you were in the hop! Love the granny squares! I have been crocheting too this summer. I just happen to be really very bad at it. Nothing to show..... 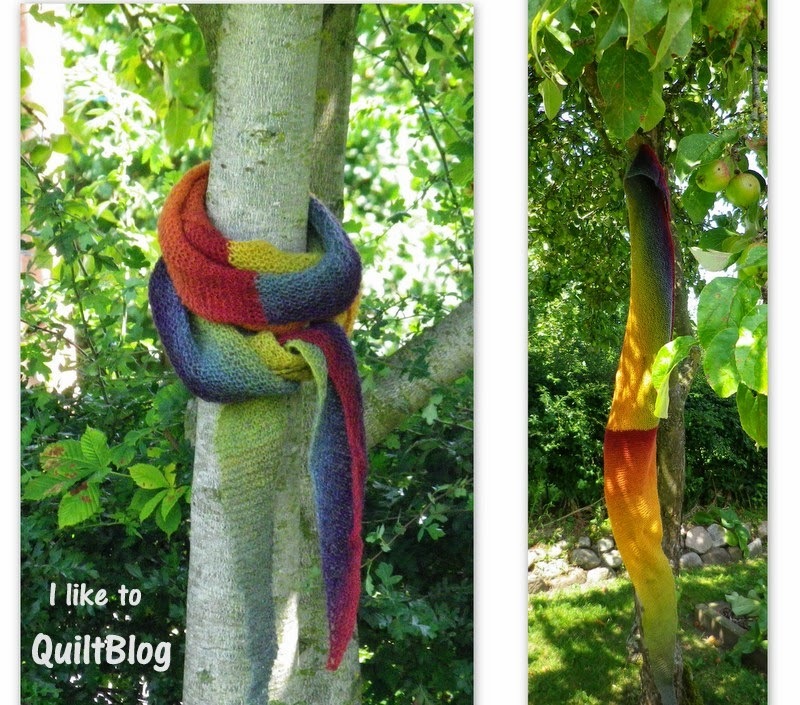 Your scarves look great on the trees. They are fantastic. The bag is just to beautiful. I enlarged the picture and was wowed by you skills! Amazing. So in Germany you had the best summer in years....while we here in The Netherlands had the wettest summer on record! Hot and humid.....I wonder what fall will bring. Thank you for sharing! Deine Schnabelina ist einfach TOLL, die gefällt mir schon länger und deine Jeans-Version mit Karo - traumhaft, so ganz mein Fall!!! I love your bag, great job on your projects! Thank you for sharing! Beautiful projects. The gingham is a perfect accent on your bag! I don't know how long you had been working on your granny squares blanket but it is wonderful, Bente! Well done on your gingham lined bag! Lovely projects! Wow! that granny square is just amazing! Love the bag too!